Gearing up for a new year, new resolutions! Eating healthy, more whole foods, whole grains. 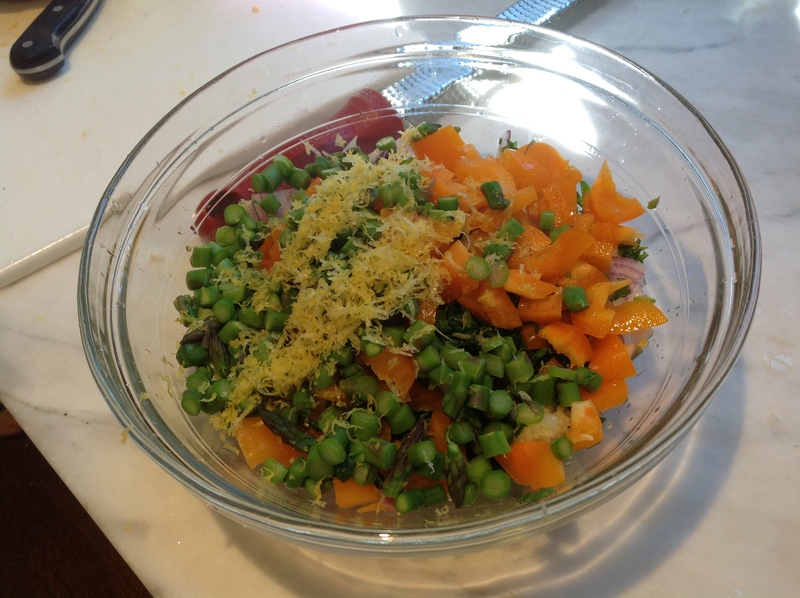 Stay tuned for revamped recipes…. Loving myfitnesspal to chart my calorie intake. There is nothing to this recipe! It’s as easy as combing all the ingredients in a large mixing bowl and mixing, chill covered with plastic wrap for about 20-30 minutes. I purchased the shrimp already cooked and cleaned from my local fish market. You can do that to save time, but of course it’s simple to buy the shrimp and throw them into boiling (salted) water. When they turn pink… just takes a few minutes…remove. I like to put them in a glass bowl with ice and chill in the fridge. The perfect quick, easy and healthy lunch! 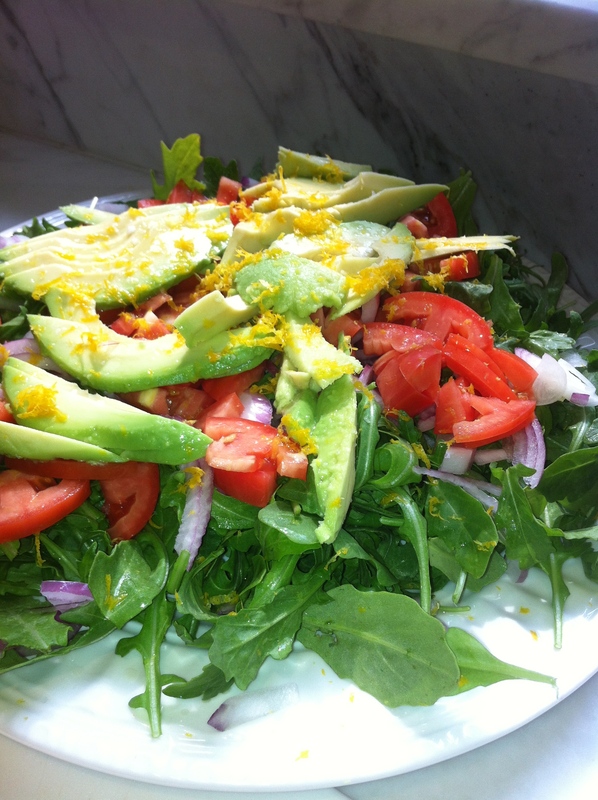 Fresh organic baby arugula, tomatoes, red onion and avocado. I like to use the zest from a meyer lemon and the juice, sprinkle of salt and fresh pepper and a tiny drizzle, just a teaspoon of olive oil. If you have never tasted a meyer lemon, it is nothing like a regular lemon. It has a much more complex flavor, more aligned with a mandarin orange or tangerine, but sour. It makes an OUTSTANDING salad dressing! 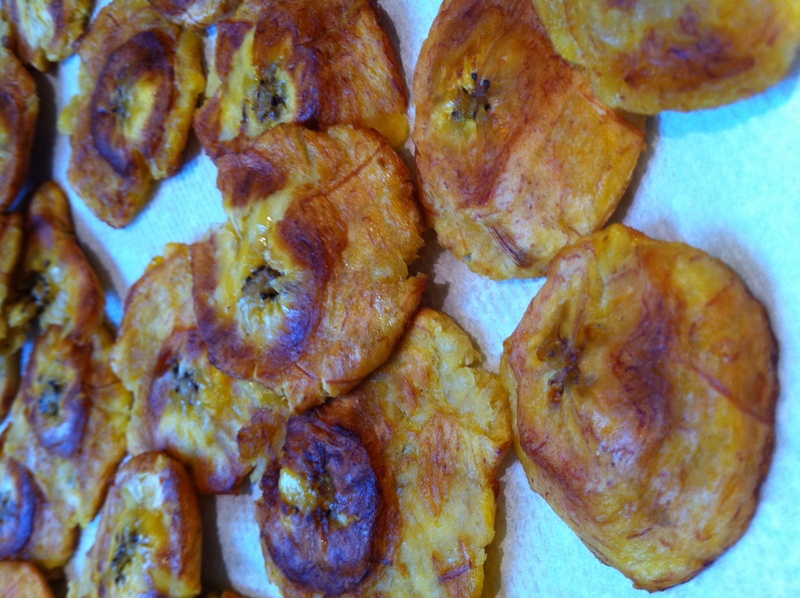 I picked up 3 plantains last week. I have never made them before and thought that the kids might like them. 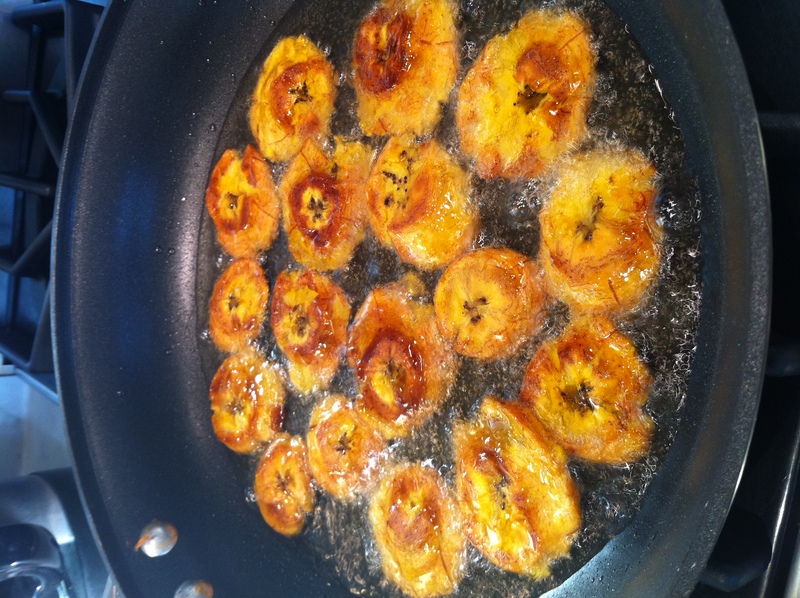 I decided to pair them with a simple meal of pan fried breaded chicken cutlets. When I purchased them from my local market, they were green, but I let them hang around for about 4 days to ripen up a bit. I figured they were ready when they became slightly speckled with a darker green blackish color. They were still firm to the touch. 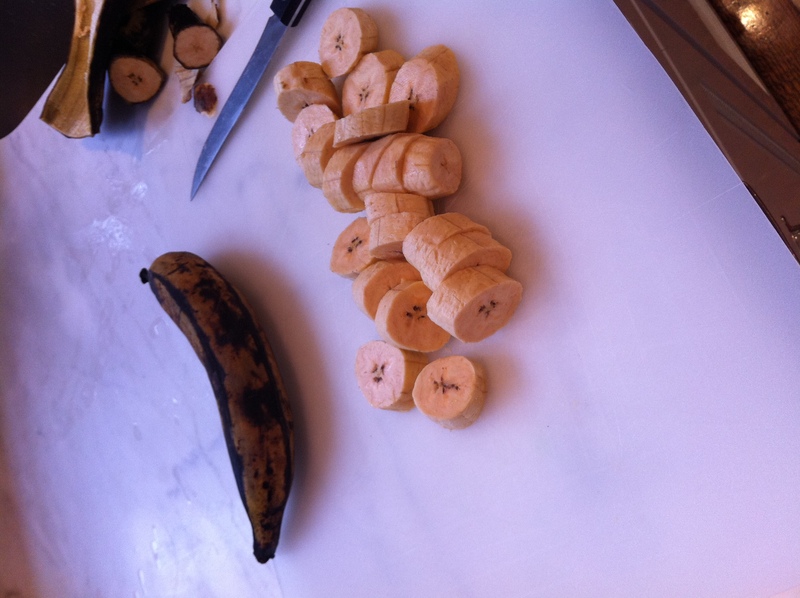 I sliced the ends of the plantain and scored the peel with a paring knife and peeled away the thick skin. 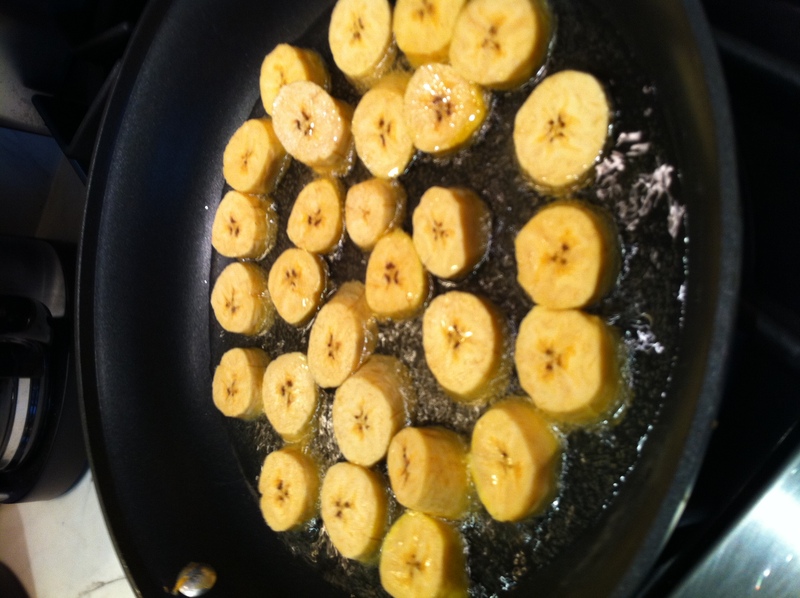 Note, that the skin of a plantain does not remove as effortlessly as a banana! 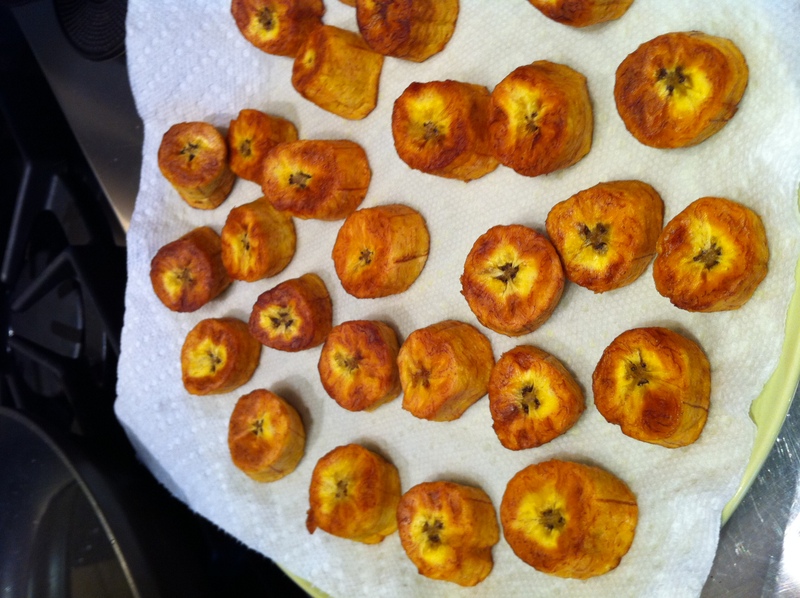 Then I fried them in canola oil, about 2 minutes on each side. After the first fry, season with sea salt while still hot. Let cool. 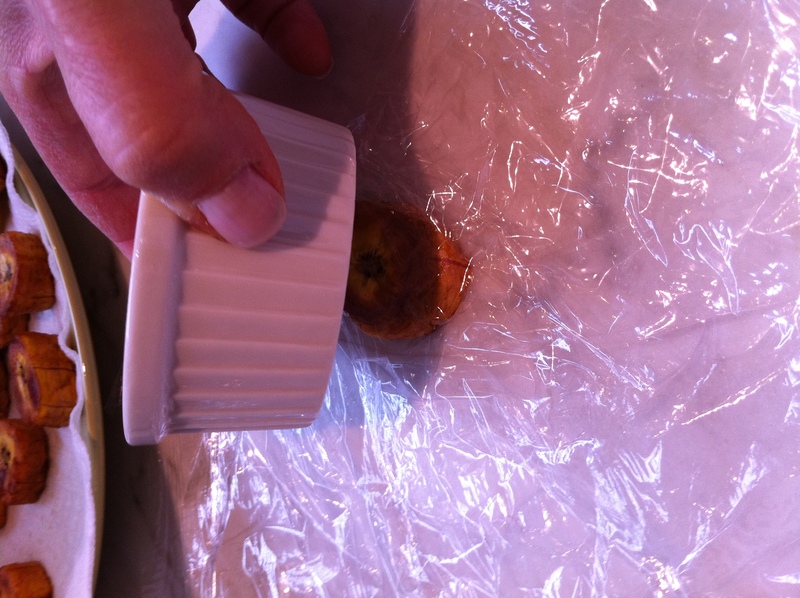 Then Lay them between 2 sheets of plastic wrap and flatten them with the back of a ramekin. Re-fry in the same oil, 2 minutes on each side. Remove to a plate with paper towel and season again with sea salt. My neighbor and I share so many of the same traditions, food memories, Italian idioms… If I re-tell her a memory from my childhood, she understands. If i say “my dad used to go to a Capozzelli party a few times a year” she knew what that was. Trippa, mom frying zucchini flowers in the early summer, bread and gravy on Sunday. These memories, are what define me and connect me to my past. Certain smells, certain foods will bring those memories back in an instant. I asked for the recipe and when I did, my neighbor invited me to her Mother’s home with loving and open arms… “Come! My mother wants to meet you! Please, she will show us both how to make it!” I went happily. We laughed she told stories of her travels to NY from Sturno, Italy when she was 17. She came over on a ship, and was sick the entire time from her small pox vaccine. I told her about my family. My father’s family was from Padula and my mother’s family was from Bosco Tre Casa. (just outside of Naples) Both are near hear village, so, many of our recipes were similar. The recipe is so simple. I have not made it yet, hope it’s as easy as it seems. I will let you know. I will also add that when i got home with this big bowl of zucchini (she insisted I take all of what she made!) I managed to eat the enitre bowl throughout the course of one day. My husband, who is not a lover of zucchini had a small bowl and could not get over how yummy it was. Truth! Split zucchini lengthwise, then cut in half moons about 1/4″ thick. Start with a large saute pan, heat about 1/2 cup or so of olive oil. Saute about 6 cloves of garlic smashed, 3-4 whole dried red peppers, about 1 tsp of red pepper flakes & salt. (She was very particular about the whole dried red peppers. She does not like the ones here in the states, and has people bring them to her from Italy. 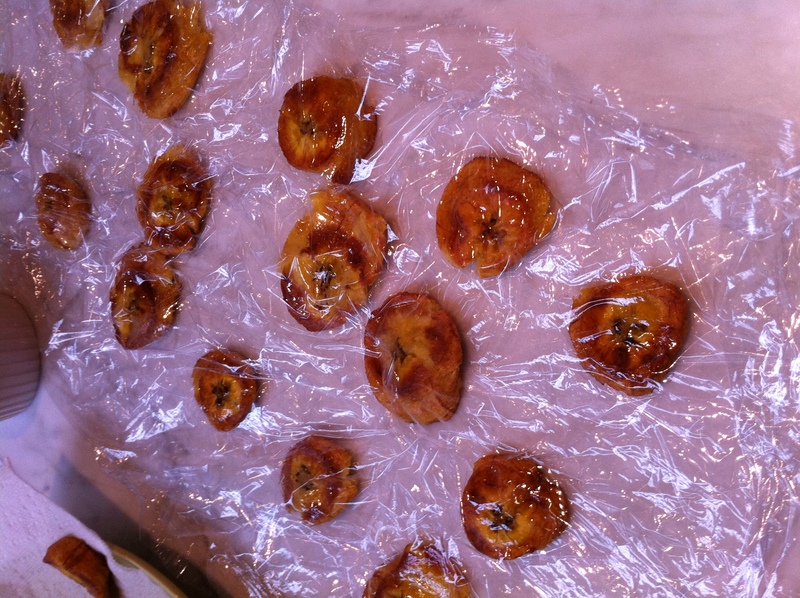 She likes them to be very soft, not too long,they should be very fine and crumbly NOT tough. I am going to check out the Italian import store in Chelsea Market, might be a good sorce…) Saute for a few minutes. From a can of 28 oz crushed tomatoes add about one cup at a time and let this fry up in the oil on med/high heat. As it reduces add more tomatoes every 5 minutes. Then add your sliced zucchini. Stir, do not let it stick. Let is sit another 5 minutes. Add about 1/2 cup water. Let cook another 10 minutes or so maybe more, stirring occasionally. You want zucchini to be tender, cooked through.